Synopsis: Nebraska Territory in 1857 is not a peaceful place. The feuding between the Speck and Grogan family that has been going on for generations is about to boil over to the point of bloodshed. Opal Speck and Adam Grogan will do just about anything to keep the peace. When Adam is caught crossing the boundaries onto Speck land, his life in in danger. Opal not wanting violence, blurts out the only thing she knows to keep Adam alive and that is that he is the father of her unborn child. Adam has to decide to deny Opal and die or accept what he knows is untrue to save his life. Their shotgun wedding just might lead to peace and so much more in this, book 2 of the Prairie Promises series. My Review: Four words...I. Loved. This. Book! As you know I'm a sucker for a marriage of convenience story, just because I know they're always interesting! 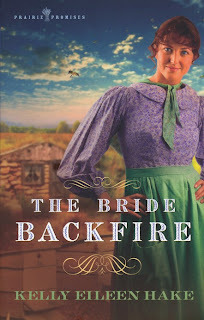 The Bride Backfire had a different twist than what I'm used to reading too...a shotgun wedding! What fun feuds are...only in books of course! Opal Speck was a great heroine, spunky and loyal to her family and her friend Midge, who leads Opal to do some interesting things! Adam Grogan seemed to be the only sensible man in his family and was a wonderful hero, always sticking up for Opal. Lucinda, Opal's mother-in-law easily fits the MIL stereotype that we all hear about except she's 5 times worse!!!! When everything wrapped up in the end I was so happy and look forward to reading The Bride Blunder. I loved this story and I think you will too, this is definitely on my keeper shelf. this sounds really good... i'll have to give it a shot! Hi Rachel! You can borrow my copy if you'd like! Yes ~ I've definitely got to get Whitney's copy of this book ASAP! I loved the first book, The Bride Backfire, and this one sounds even better! Hi Lori! I haven't read The Bride Bargain yet! You know me, I always read out of order :-P I think I'll read that one next!